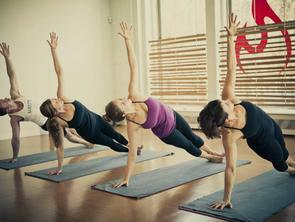 Formerly known as Moksha Yoga, Modo Yoga LA is part of a global network of green, clean hot yoga studios. 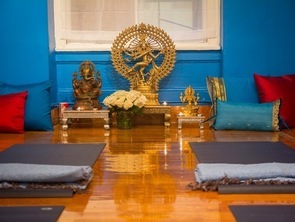 The name derives from a Sanskrit word that means “Freedom,” and the studio gives working professionals and other busy individuals just that: the freedom to slow down and connect in classes that fit into their hectic schedules. After all, one of the seven pillars of Modo is Sangha Support, which describes a community of people supporting one another. That Sangha Suppport vibe can be felt in the lively lobby and silent practice rooms alike. This is not who can do the straightest headstand yoga, this is yoga for people who prefer a supportive community to go along with their outstanding strength and cardio workout. Classes Offered: Modo Yoga, Modo Music, Modo Flow (Vinyasa), Yin Yoga (Moving Meditation), Yang Yin (A mix of Modo, Modo Flow and Kriyas), Silent Modo, Karma Class (donation yoga), Candlelit Class. All classes are practiced in 98-100 degree heat, and are 60 minutes, 75 minutes or 90 minutes. Why It’s So Effective: The hot – but not quite Bikram hot – classroom environment of Modo Yoga enables students to safely stretch and open the body while cleansing the skin. This heat also requires students to be in touch with their bodies, and especially focus on breathing. In addition to flexibility and breath focus, Modo offers cardio benefits, and the type of all-over body strengthening that can only be produced by supporting your own bodyweight while dripping from the effort. Let’s not forget the mental benefits of the class! Taking 60-90 minutes to slow down promotes stress relief and mental clarity, so your brain leaves the class refreshed as as your body. Know Before You Go: Classes start on time at Modo, and students arriving after the class has begun will not be admitted into the practice room. The studio encourages students to come 15 minutes prior to class in order to unwind, adjust to the heat and prepare for the challenging class ahead. Remove your shoes upon arrival, and get ready to flow. Come Prepared With: To combat the inevitable sweat, students should come prepared with a mat, two towels and a water bottle. Mats and towels are also available for rent or purchase at the studio, and while bottled water is not sold onsite (what green studio would sell bottled water? ), filtered water is available for refills. Come dressed in light clothing that you are comfortable sweating, stretching and moving in. Fitting a class in between meetings? Locker rooms and showers are available onsite to freshen up for what’s ahead. Don’t finalize the details of those meetings in the studio, though: the silent practice room policy definitely applies to cell phones. Feeling inspired? Check out their schedule here.